Now that users have found your website, it’s time to build meaningful relationships with them. With smart email marketing you’ll see more subscribers, improved open rates, increased traffic and a positive ROI. In short, our email experiences cut through the clutter of even the busiest inbox. Full Service: Includes email design, coding, content development and strategy. We also segment your lists, load the email into the mail system, send the email and provide reporting. Self Service: Includes design, coding content, strategy and reporting. 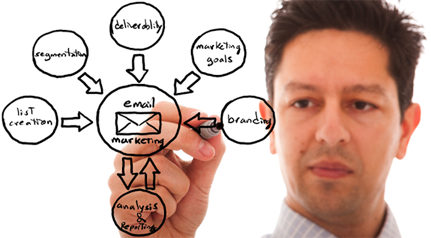 But we train you to send and manage your email campaigns according to your schedule. We get to the heart of your campaign goals and customize an email strategy that engages users and encourages clicks. Audit the design, message, technical aspects and performance of your current email initiatives. Recommend improvements to optimize the creative, increase subscribers and improve deliverability. Outline a communication plan for sending emails that are strategically aligned with your marketing programs. Determine your service needs – full-service versus self-service. Create email content and design. Our emails are well-branded, well-crafted and well-coded to inspire and engage your readers. Create designs aligned with your brand and marketing goals. Develop messaging that encourages action. Code designs to ensure they display across email clients (Outlook, Gmail, Yahoo, Hotmail and AOL). Schedule and send your email. Our optimization and delivery plans ensure your email reaches the right users. Determine a schedule and audience segmentation plan. Set up welcome series and trigger emails. Test, optimize and provide reporting. With precise testing and tracking, we fine-tune your email with design and messaging that’s right for your subscribers. Track campaigns in Google Analytics. Conduct A/B testing of elements such as subject lines, graphics and content variations. Watch key stats such as open rates, bounce rates and click-throughs. Provide detailed reporting, analysis and recommendations for improving your campaign.